A gambrel style is often called a barn roof. Its double, or sometimes triple, slopes on each side of a peak provide more space inside the roof, which is attractive to homeowners too. A gable roof has only two rafter or truss chord angles, a top cut at the peak and a bottom cut at the walls. A gambrel has four angles, at the peak, at the wall and where the two rafters or truss chords connect. 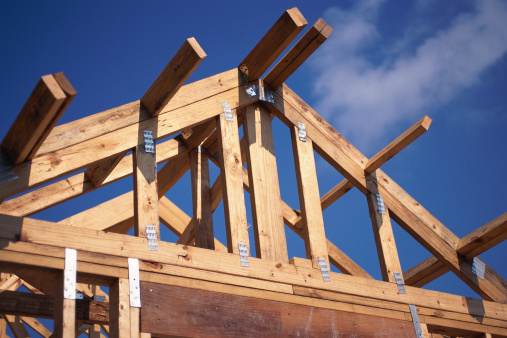 There are three ways to calculate angles for gable trusses, which are rafters built with internal braces and installed as a unit. Calculate gambrel angles with graph paper and a protractor. Draw a semi-circle on the graph paper, mark a center peak at the top and draw two lines on each side in the shape desired for the gambrel roof. Use the protractor to measure those angles, at the peak, the walls and the point where the two lines intersect on the top side of the roof. Determine a pitch for the top slope of the gambrel roof, the rise in inches per foot from the midpoint connection to the peak; 7/12, or a rise of 7 inches per foot, is a common top gambrel pitch. Reverse that for the bottom angle; make that pitch 12/7, a drop of 7 inches per foot from the connection to the wall. Draw a scale plan on graph paper and measure the rise to figure the pitch. Make the angles for four cuts add to 90 degrees; if the angle of the cuts on the top chord is 30, the angle on the bottom chord must be 60. Rely on a basic gambrel formula if necessary -- that is, all four chords are cut at 22.5 degree angles, so they fit together to equal 90 degrees. Adapt the same techniques to figure angles for a gambrel roof that has three slopes on each side rather than two. Check three points with the protractor rather than two, use a combination of the two top pitches to figure the reverse for the bottom chord or adjust the six angles, rather than four, to add to 90 degrees. What Do the Numbers in Roof Pitch Mean?